Sheriff’s Office is asking for the public’s assistance in identifying the following individuals. The Sheriff’s Office & Crime Stoppers are asking for the public’s assistance in identifying the following individuals. Case information is not being release to the public at this time. Anyone with information are asked to contact the Sheriff’s Office or remain anonymous by using Crime Stoppers. 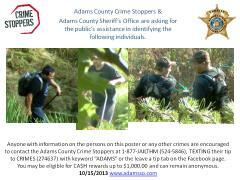 Anyone with information are asked to contact the Sheriff’s Office or remain anonymous by using Crime Stoppers.